Are you ready for a good laugh? 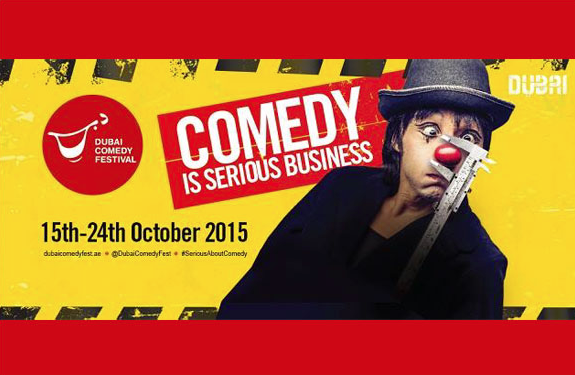 This October the Dubai Comedy Festival, is taking place between 15th and 24th October. Some world’s top comedy heavyweights are descending on the Emirate like International comedy icon, Dave Chappelle and the new host of Comedy Central’s The Daily Show, Trevor Noah will headline a 10-day programme of events, activities, promotions and appearances by local, regional and international comedians, for what is set to be the region’s largest comedy festival. The Dubai Comedy Festival is also family and kids friendly event with the performance of Mac King Magician and Comedian. With a big howdy, and a warm smile, Mac King has welcomed and captivated audiences as he casts out a fishing line over their heads and catches live goldfish out of mid-air, performs amazing sleights-of-hand, makes his head completely disappear in a paper bag, and renders himself invisible, all while remaining unbelievably funny. Because of his quick wit and extensive audience interaction, no two shows are alike. If you are not already booking your tickets, keep reading as we got the opportunity to ask the man himself a few questions about his passion and his Dubai performance at the Festival. 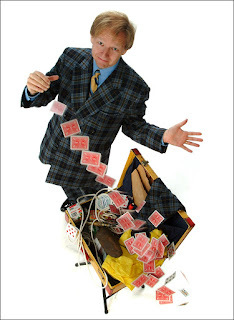 1 / How did you get into Magic and Comedy?Both of my grandfathers knew a couple of magic tricks. My mother's father actually had a few books on his bookshelf that taught simple tricks. When I'd visit him he'd do a trick for me and when I asked him how the trick was done, he'd point me toward the books and say that the secret was in one of them. I'd spend the rest of my visit going through those books trying to discover the secret of the trick he'd just fooled me with. And a result I learned a lot of other tricks. After a while I started doing little shows in my grandparents' living room for all their friends. I think many people try out magic as a hobby when they're young, but I found that I loved it and seemed to have a knack for it, so I kept it up. As for the comedy aspect of my show, it's just as important to me as the magic part. I'm really trying to not just be a typical magician. I try to make the magic as funny as possible. And again I go back to my family for the origins of that. Everyone in my family is very funny. Growing up we were always trying to one up each other with our jokes and whenever we're together now it's still like that. 2 / Please, tell us about your show at Dubai Comedy Festival, taking place between 15th and 24th October? Without spoiling the surprise, what can we expect? I'm really trying to combine mind-blowing magic tricks with side-splitting comedy. The tricks are things you won't have seen other magicians do (there's a real-life "Cloak of Invisibility). Everything is very family friendly. I'm very proud of the fact that kids, teens adults and grandparents all seem to love my show. 3 / Whats your favourite act from your repertoire?I do a trick with a camping tent that is combined with crazy hand-shadows and an amazing giant surprise at the end. The audience always screams! 4/ How do you get inspire and get into new tricks?I have some smart friends who give me ideas or help me refine my ideas into something I can get out on stage. By doing 10 shows a week here in Las Vegas I have an amazing laboratory to experiment with new ideas and tricks. It's really fun for me to get to try out new ideas. 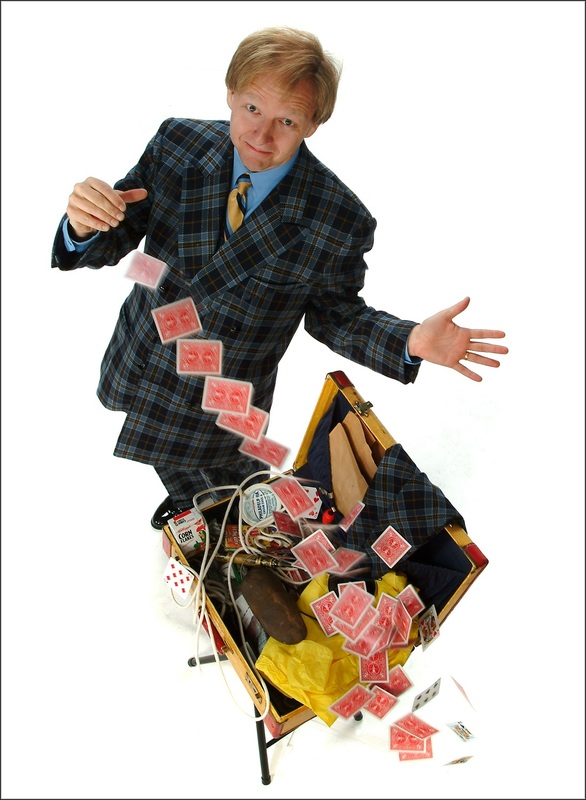 5 / Tell us a bit about your line of products for amateur magicians with like Mac King’s Trunk-O-Tricks™ and Book-O-Magic™. Seems like a lot of funs for the kiddos. I've always thought magic makes a great hobby for kids and adults. It's a great skill to be able to read something in a book and be able to translate those written words into physical actions. It teaches problem-solving. It teaches you to be comfortable speaking in public. For shy kids it's cool to be able to have secret knowledge that none of your friends know. I like encouraging kids to read.